Home » Barbs and Backlashes » What Lurks Beneath? I have some piles of data on my messy desk right now; I am putting stuff together for the 2017 Fishing Forecast. It should be done and available near the first of the year, just like it is every year. I will be sure to get the word out when it is ready. . . .
Until then, I know that no matter how much I say or what data I show, nothing beats some pictures! 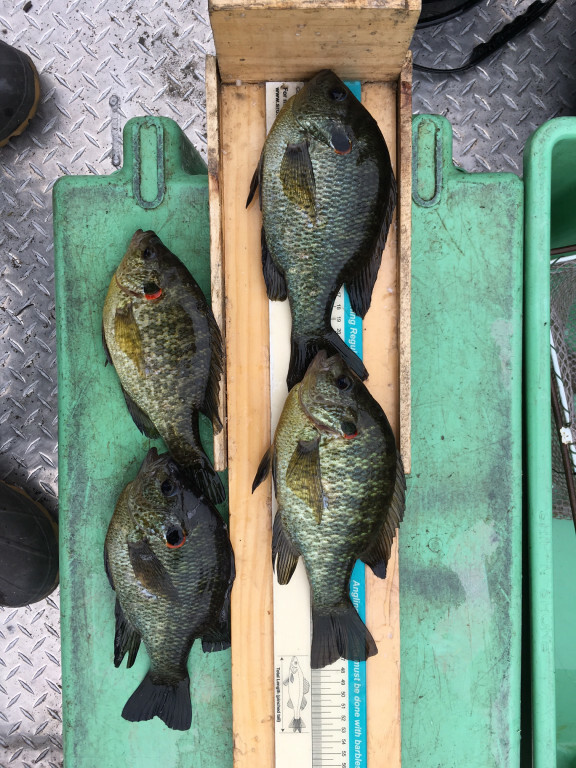 So, to tease you a little bit, I again want to show you a few pictures of some of the fish our fisheries biologists have captured from a variety of waters around the state. Once again let me start with the disclaimer: When we are sampling fish populations we are NOT out there trying to capture the largest fish. We want a representative sample of all the sizes of fish present in a fish community. But, in the process we do see some really nice fish from time to time. 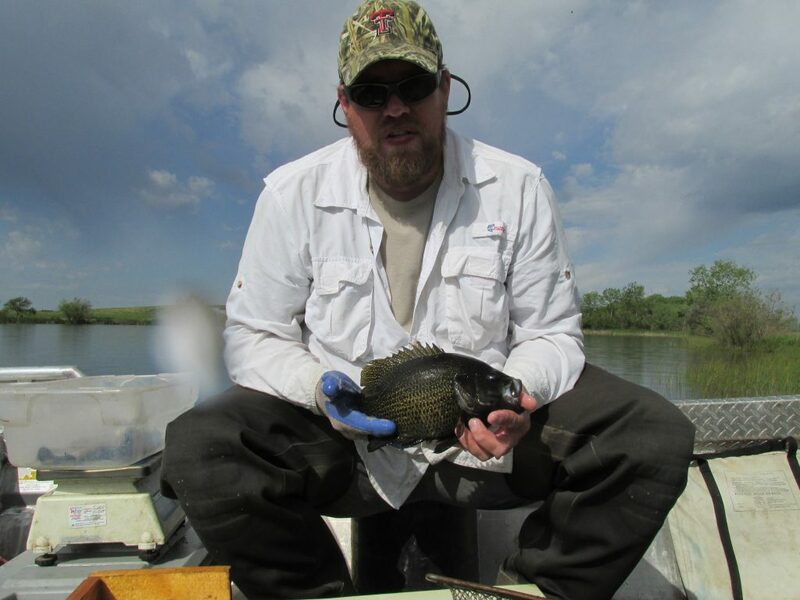 Fisheries Biologist Caleb Huber with a dark, interstate lake Rock Bass. Fisheries Biologist Jared Lorensen shared those photos with me. Thanks, Jared! 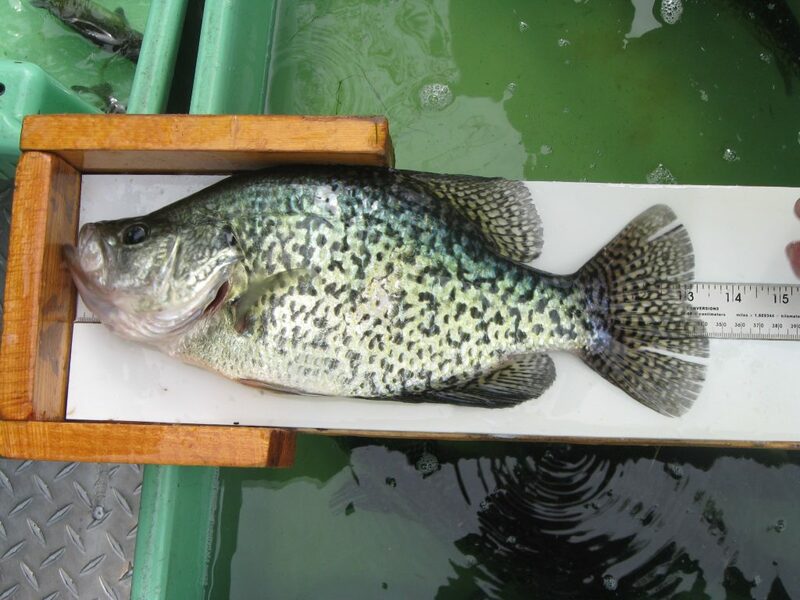 But, Jared did not share only panfish photos with me! 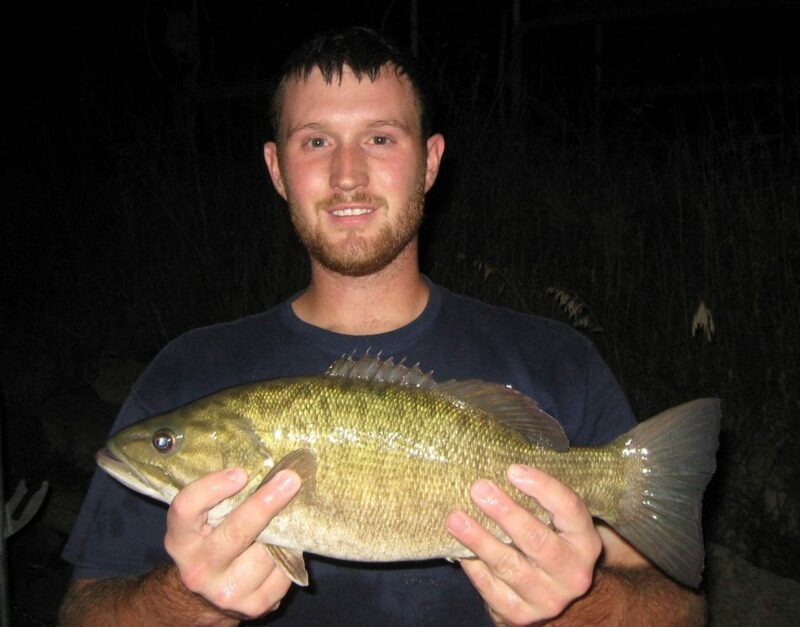 Sam Eilers holding fish. Jared Lorensen photo. 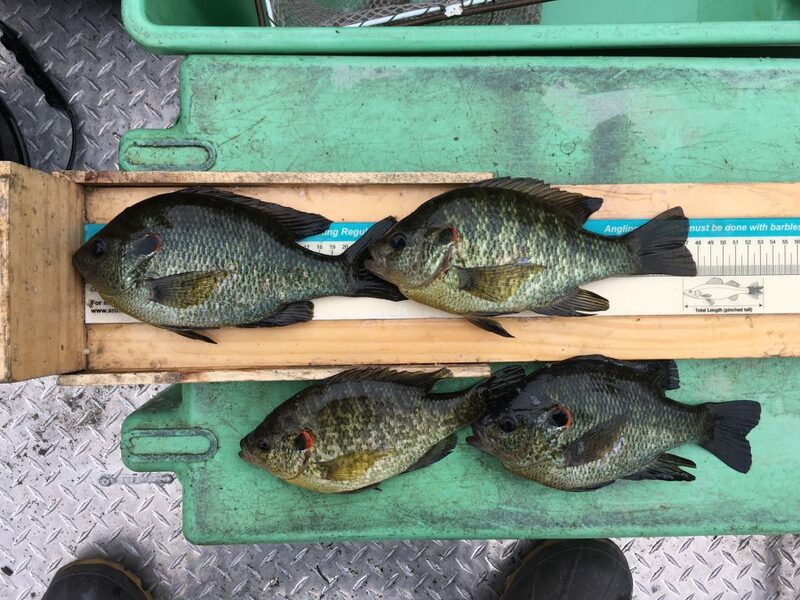 Fisheries Biologist Joe Rydell also sent some photos of fish they recently encountered out in the Nebraska panhandle. Again, Thanks! Joe! Box Butte Reservoir has Common Carp present in it; that is nothing unusual. 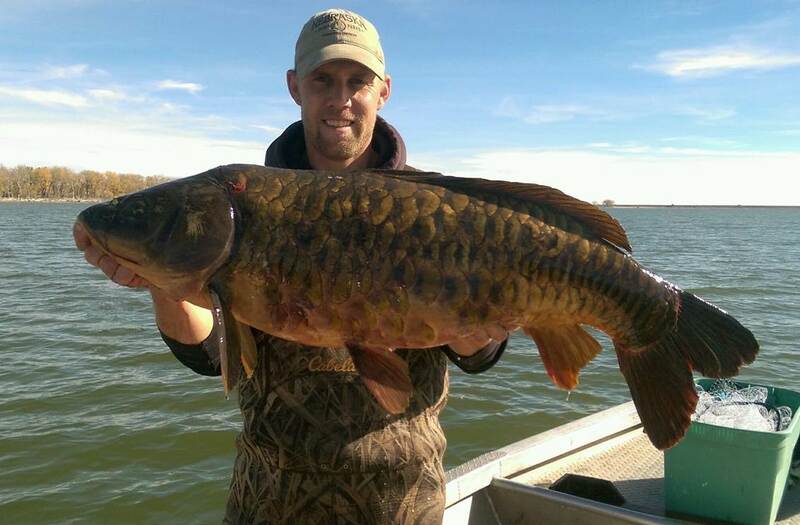 What is unusual is that the Common Carp in Box Butte seem to all have the odd “Mirror Carp” scale pattern. Mirror Carp are the same species as Common Carp, Cyprinus carpio, but in most places the “mirror” scalation is unusual. Not at Box Butte, and they ain’t small either. 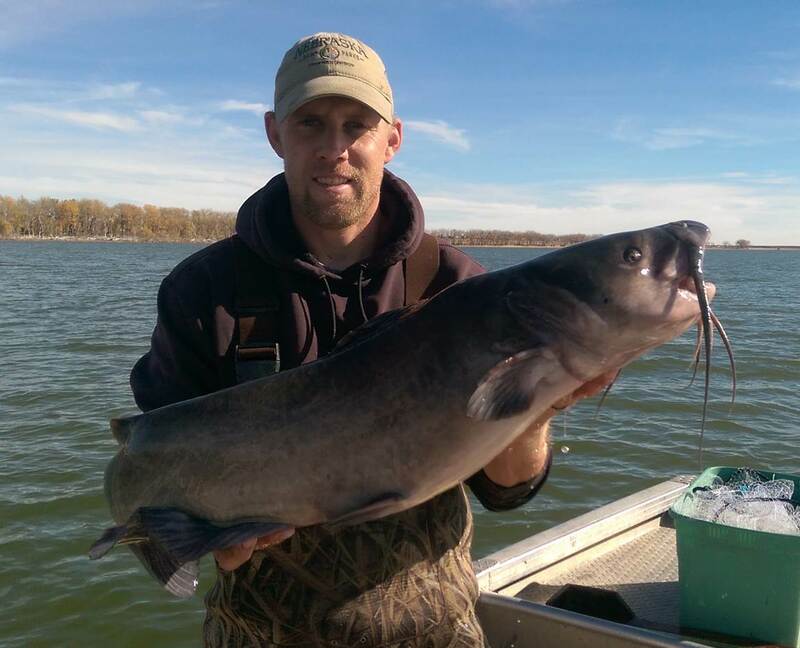 Box Butte is known for producing some big Channel Catfish too, not a lot of catfish, but some trophies. Oliver Reservoir is out in western Nebraska near Kimball. In recent years relatively low water levels have been a limiting factor for the Oliver fishery. But, there are still some nice fish there. At one time Muskies were stocked in Oliver, but that stocking was curtailed with the low water levels. So, no Muskies have been stocked in Oliver since 2006, and I would not tell you that I would expect to go to Oliver and catch a Muskie. But, there can always be some surprises and our fisheries biologists found one of those on Oliver when they were sampling this fall. A 48-inch surprise! 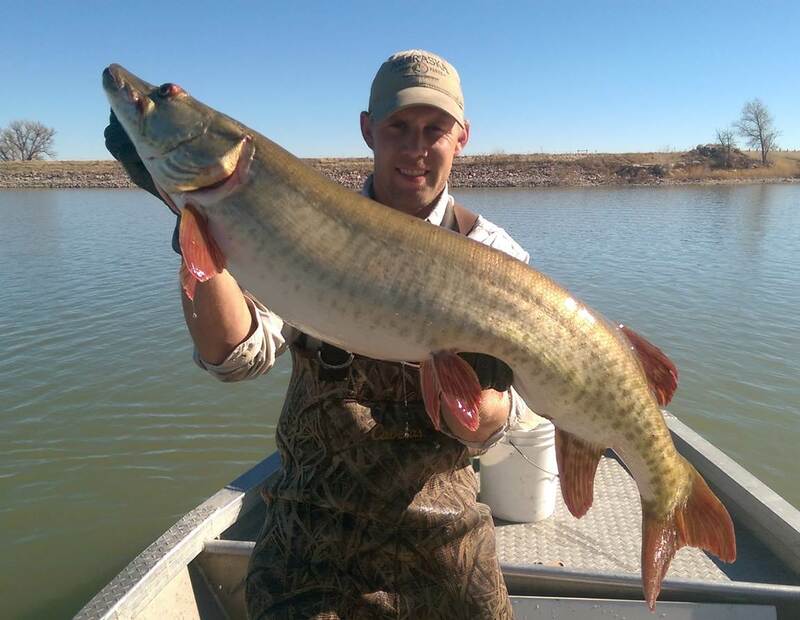 Joe Rydell holding a 48-inch Oliver Reservoir Muskie. 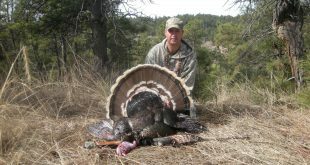 As is often the case, especially with large predator fish, where the numbers are limited, the few individuals that are present can be very large and very healthy! We are not able to sample every waterbody in the state every year. Some of the largest, most important we do sample annually, but others we get to once every two to five years. Merritt is one of the fisheries that is sampled annually and we always see some nice Walleyes there. 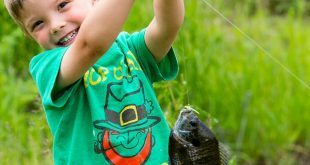 Merritt is one of our best Walleye habitats and consistently one of the state’s best Walleye fisheries. 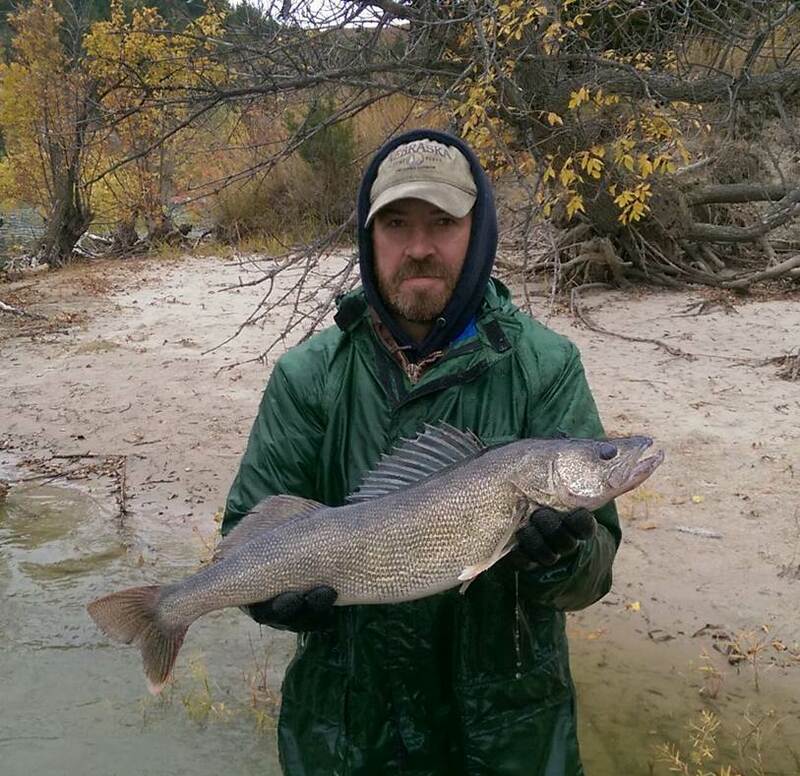 Lastly, I have a photo of Fisheries Biologist Zac Brashears holding a representative Merritt Walleye! As you can see in the photos, sometimes the field work is really pleasant, on beautiful days, and sometimes it is less than that. Our fisheries biologists work through it all, and have sampled a lot of fish from a lot of waters. These pictures represent just a handful of the “highlights”; just know that all those fish are back in the water swimming, and they can be caught on rod & reel too! Thank you guys for doing all the work! More details on the best waters to fish in the coming year will be available soon!